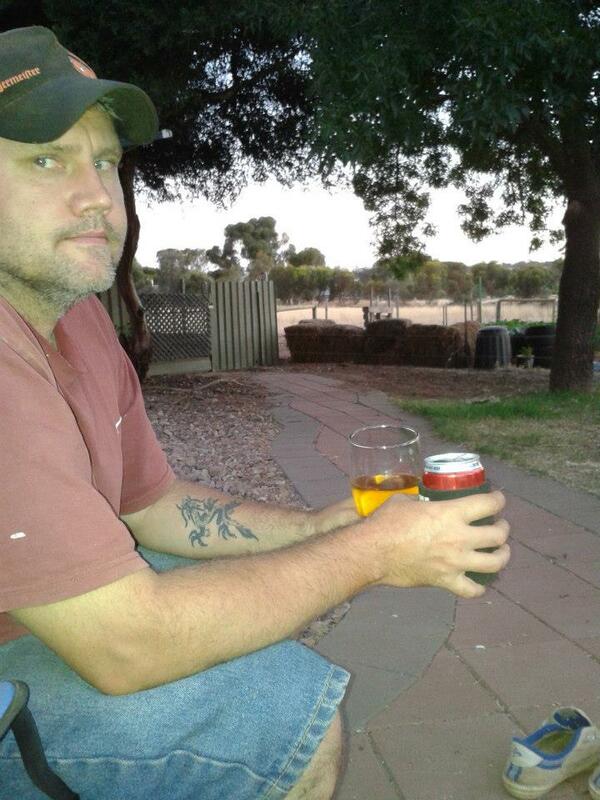 December is traditionally quite warm in South Australia, and 2012 was no exception. 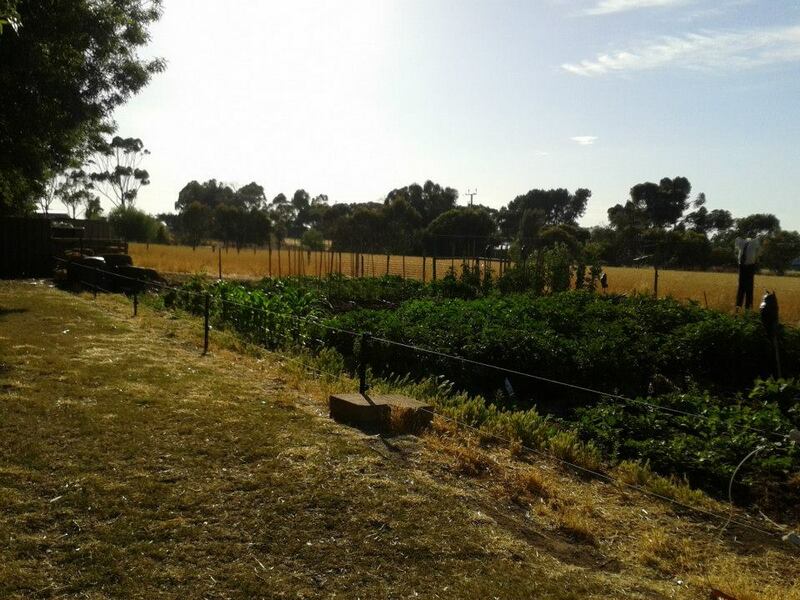 We’re about 75km north of Adelaide, and our temperatures are normally 3 or 4 degrees hotter. I’m not exactly sure why, but guess it’s because we’re further from the ocean. The warmer month kept us from doing everything we wanted, but we adapted by making sure we put in a few hours after work during the week. 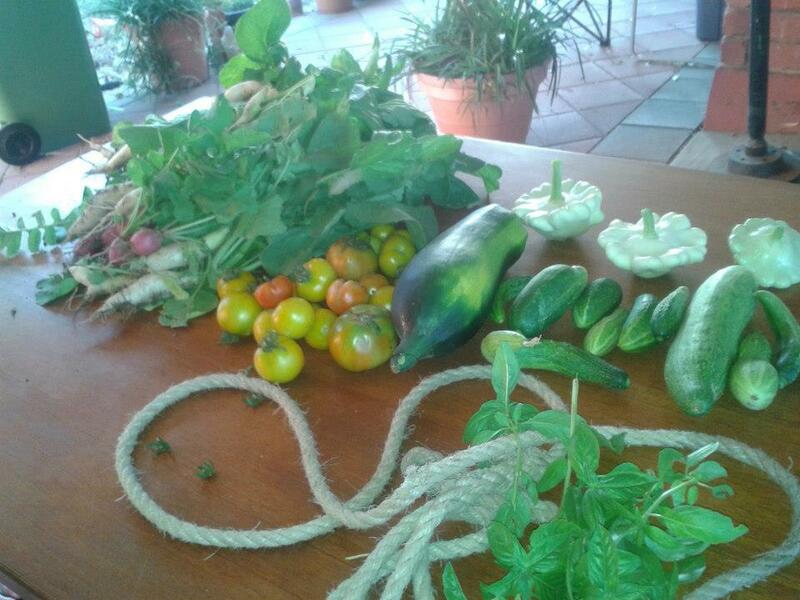 Being Summer also meant lots of harvesting, and we tried to make the most of that. 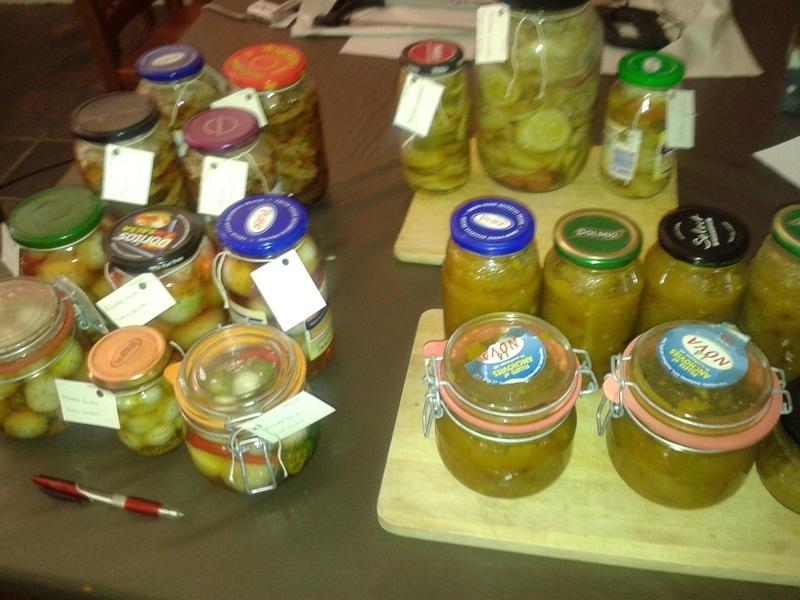 We went all-out on preserving and storing producing for out-of-season consumption. 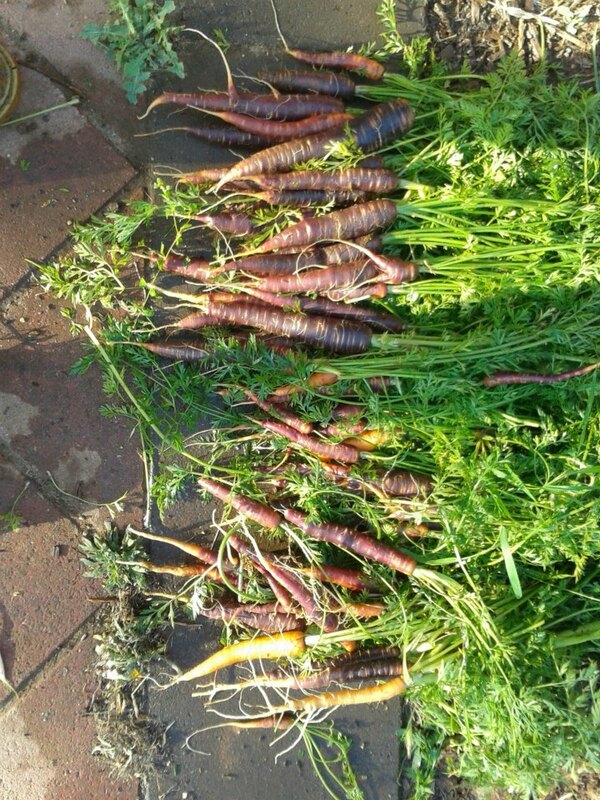 Purple carrot harvest. I think we’ll stick to our stump-rooted variety, as these bolted a bit too easily. 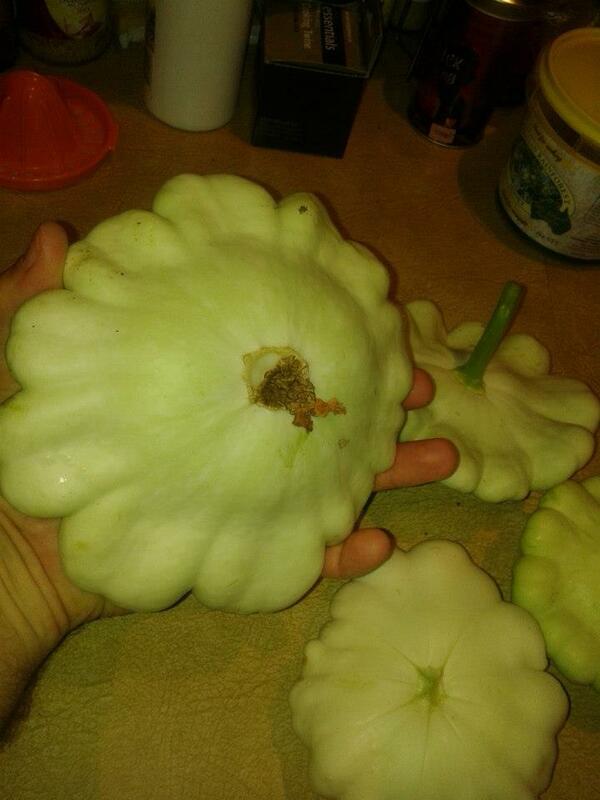 We ended up getting dinner plate sized squash! 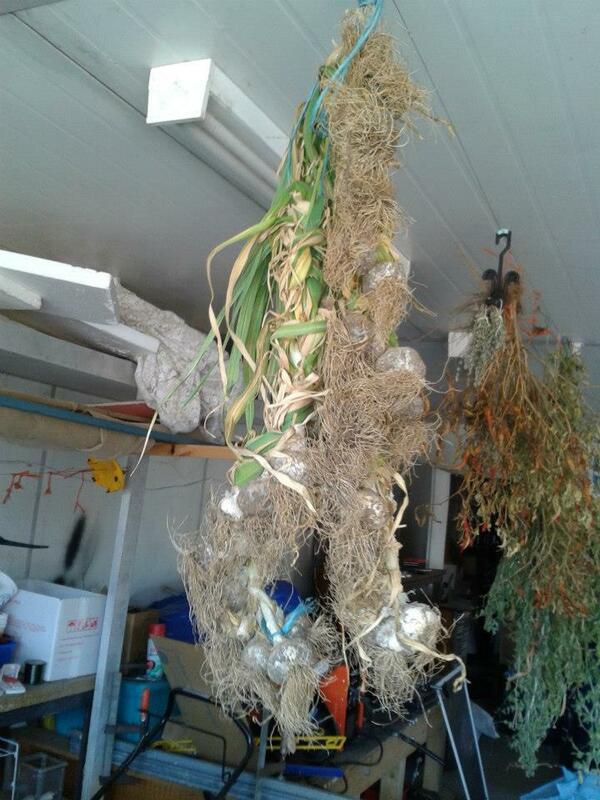 The garlic was ready a full month ahead of what I was expecting. We had some super-hot days, and I think that finished them off. Linhda plaited them like a champ! 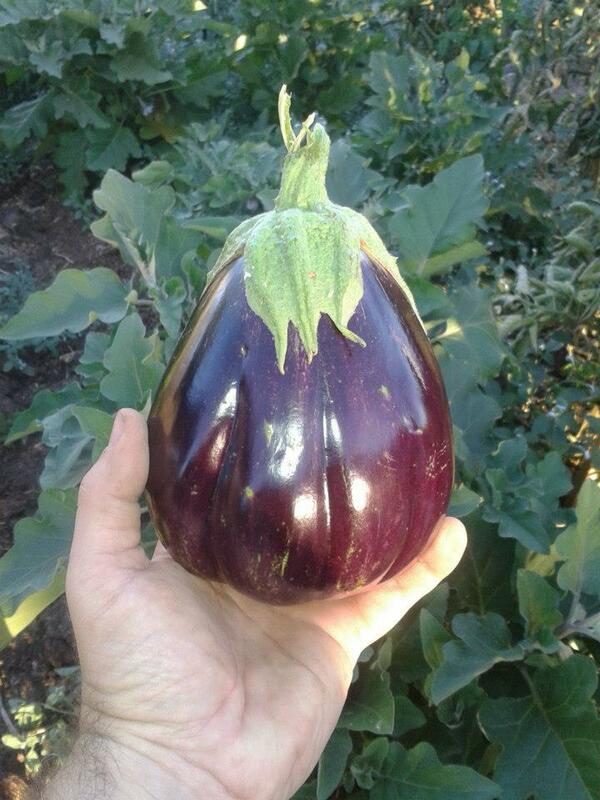 I had planned on growing an entire year’s worth, but we might be a bit short. 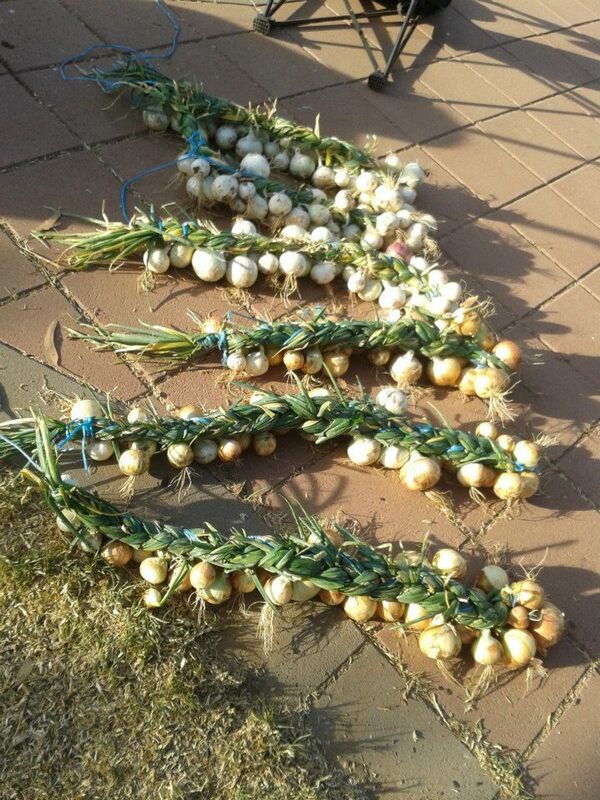 We also harvested all of the onions, and Linhda got to try her plaiting skills again. This was also supposed to be enough for a year, but we might only have half of what we need. 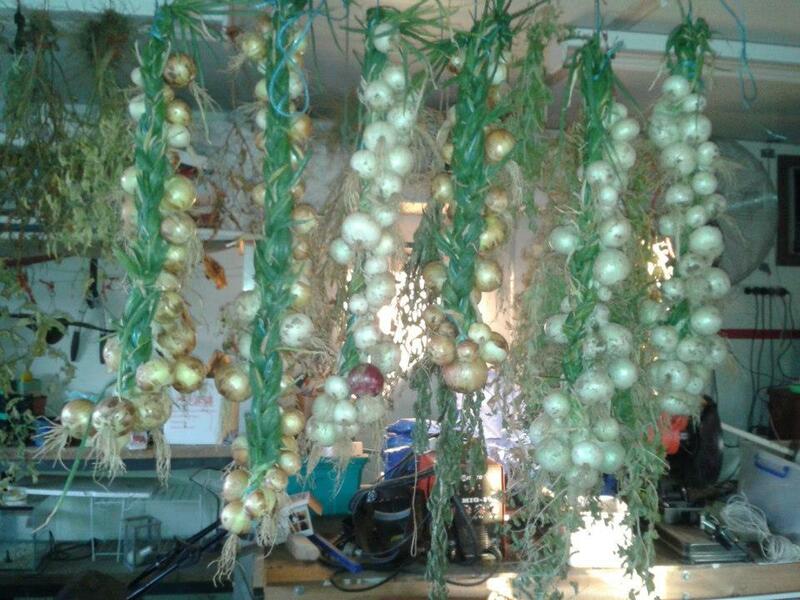 Our onion harvest. Not quite the year’s worth I wanted. Our chillies went nuts this year. I really need to not grow them for a year or two, but I love growing them so much! The bushes are really very pretty, and nothing says Summer to me more than heavily laden chilli plants. However, we still have enough frozen and preserved chillies from last year to last us all through this year. We did run out of ground chilli, but it didn’t take much to restock that. 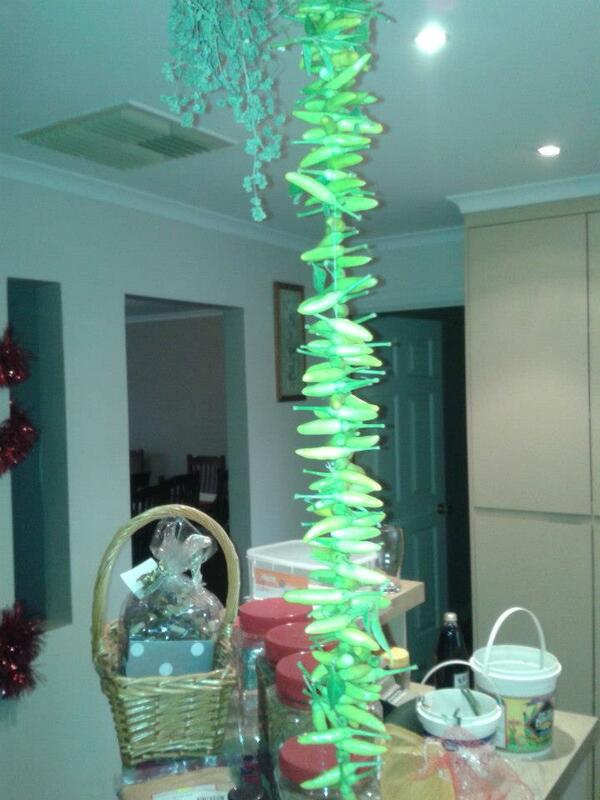 I used a needle and thread to make strands of chillies to hang in the kitchen. I have 4 in there now, and they’re actually quite attractive. 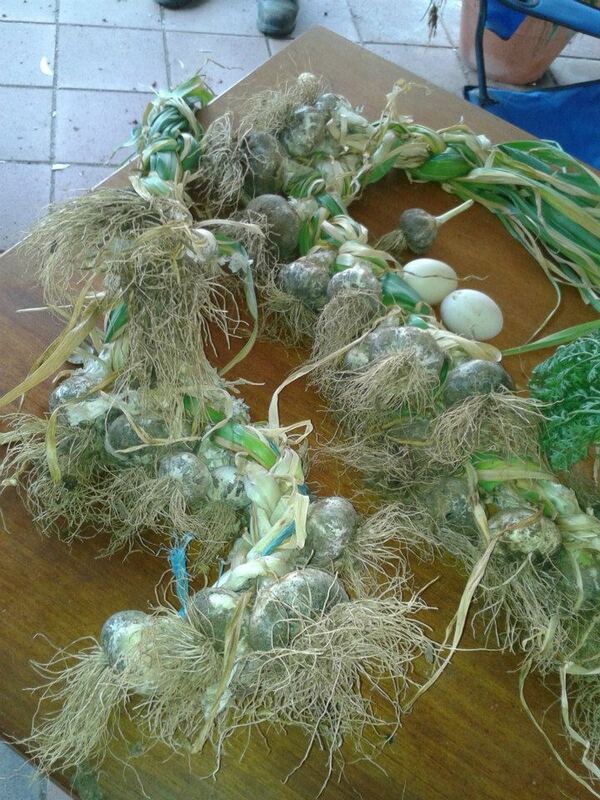 I did a strand for Linhda’s sister, and we’ve given away a fair few chillies to friends. The chillies are still producing though, and I’d be surprised if we manage to use half the crop. Chilli thread! They ripen and go red as time goes on. 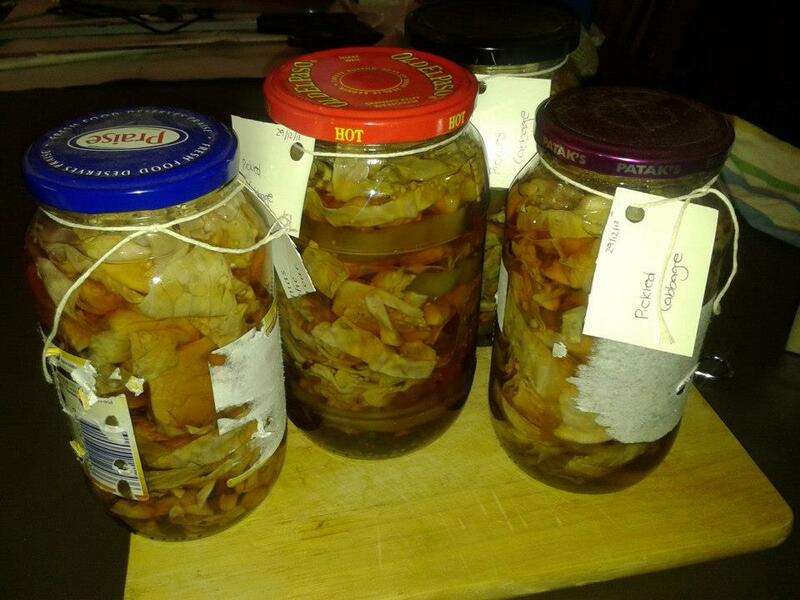 We’ve also had a few preserving days. The preparation takes a surprising amount of time, as we have to peel, chop, and salt pretty much everything. We’ve experimented with a few different preserves and combinations, and so far haven’t had a real failure. 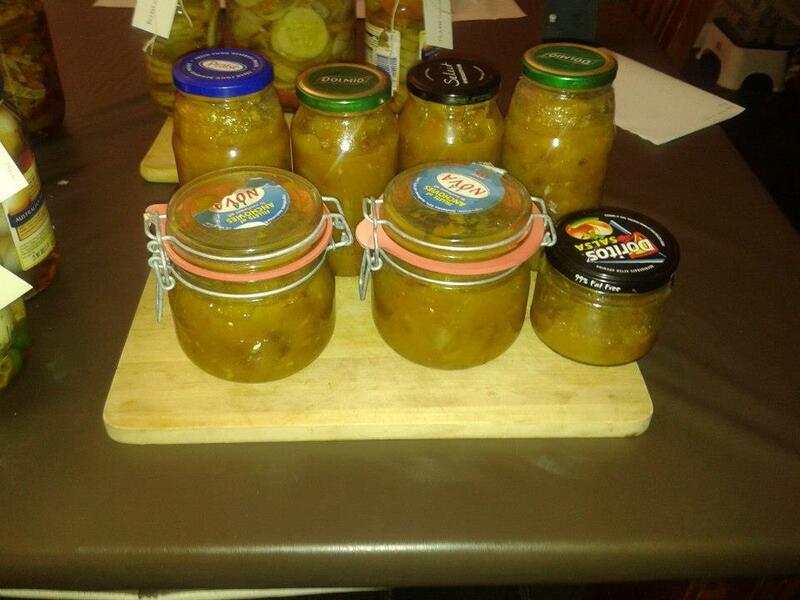 Linhda has tried a heap of different chutneys, including things like bulking it out with zucchinis and squash. All of them have been excellent. 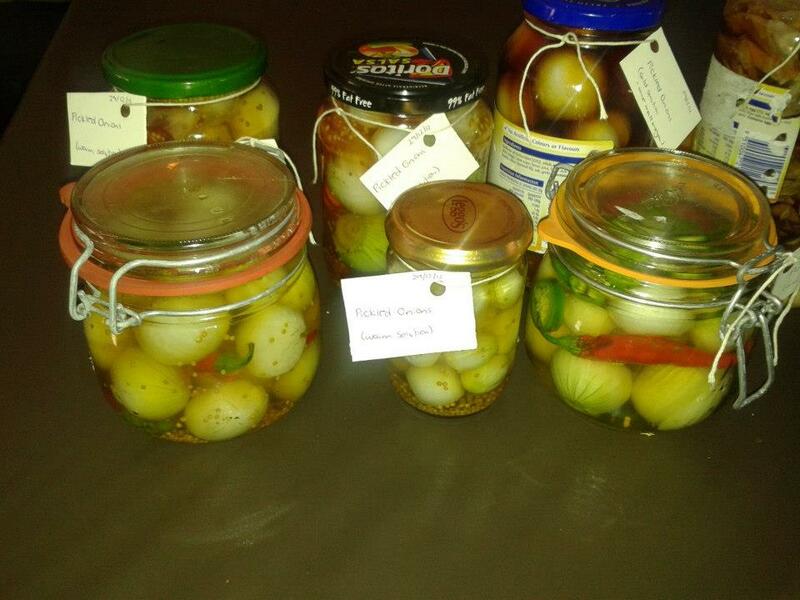 I pickled the smaller onions after our harvest, and experimented with solutions and things like chillies. YUM! 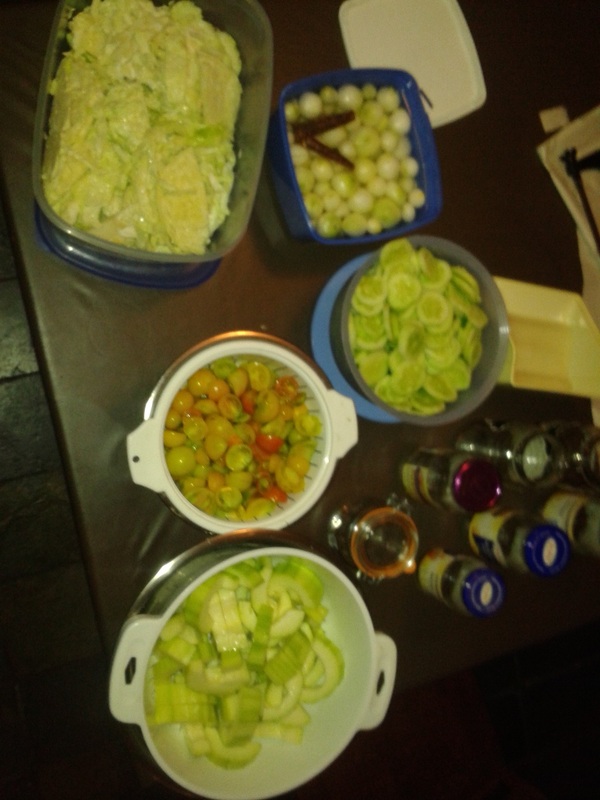 We also wised up when it comes to the preserving and bought some bulk materials. Buying things like vinegar, sugar, and salt in supermarket quantities just wasn’t cutting it. 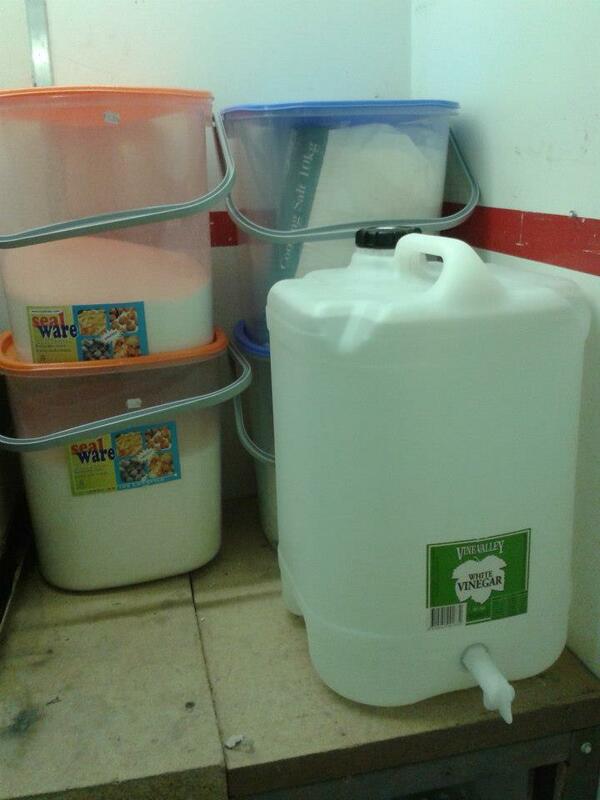 20kg salt, 25kg sugar, and 25 litres of vinegar. 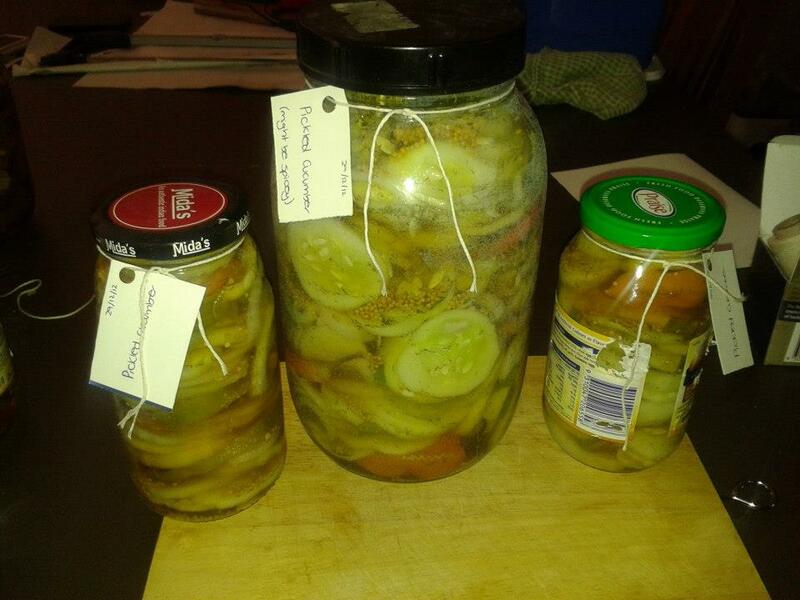 Bring on the preserving! 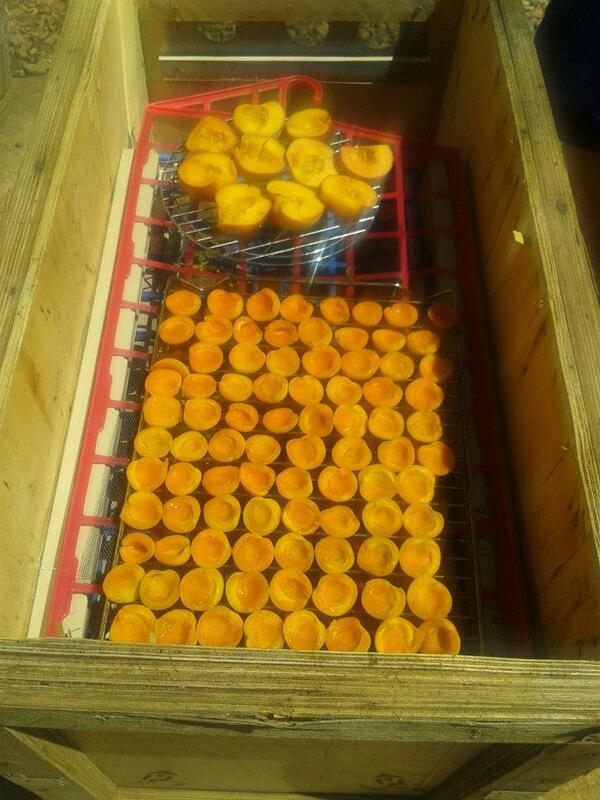 Our last harvest experiment was a dehydrator. Dad and I found some plans on the interweb, discussed them at length, and modified them to suit our own ideas. We used mostly recycled materials, a Perspex lid being the only thing we bought. The bottom is clad in black plastic, has some intake baffles cut down low, and has a metal baffle (a recycled BBQ plate) to both heat up and force the warm air where we want it. It works like a freaking champ, and we tried both home-grown tomatoes and apricots. 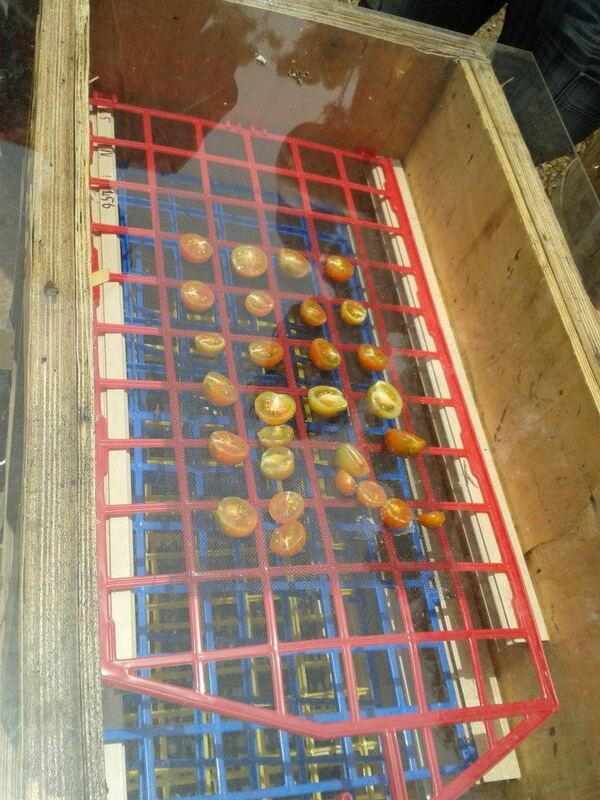 Home-grown tomatoes in the dehydrator. Home-grown apricots and store-bought peaches in the dehydrator. 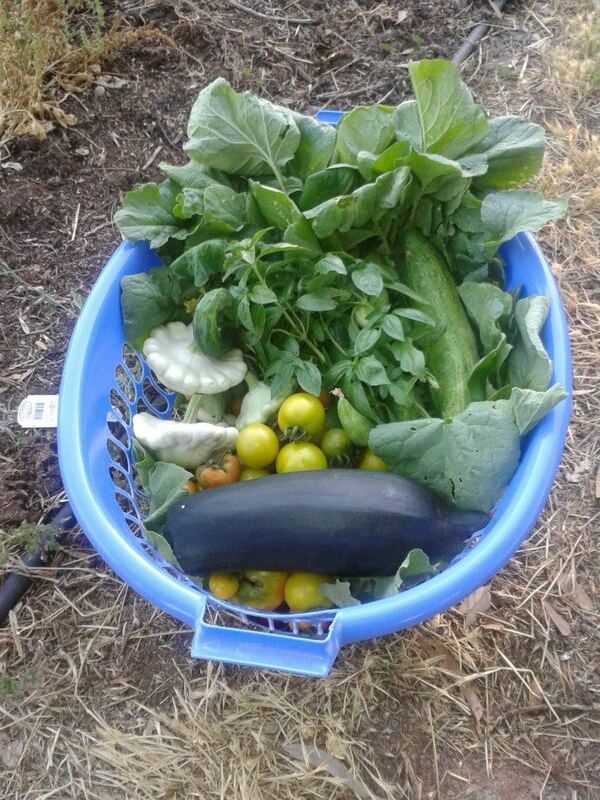 While our grown produce was doing big things, the animals were also motoring along. 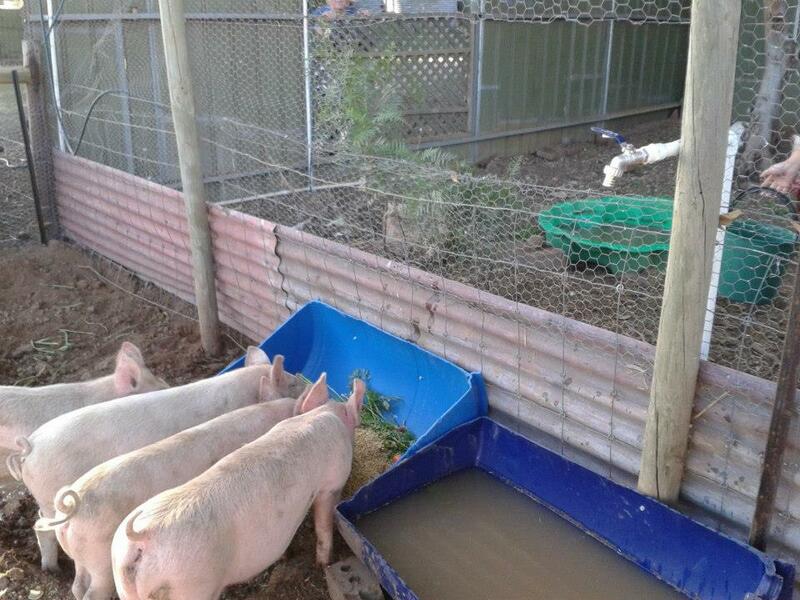 The pigs were growing pretty much only like pigs can. 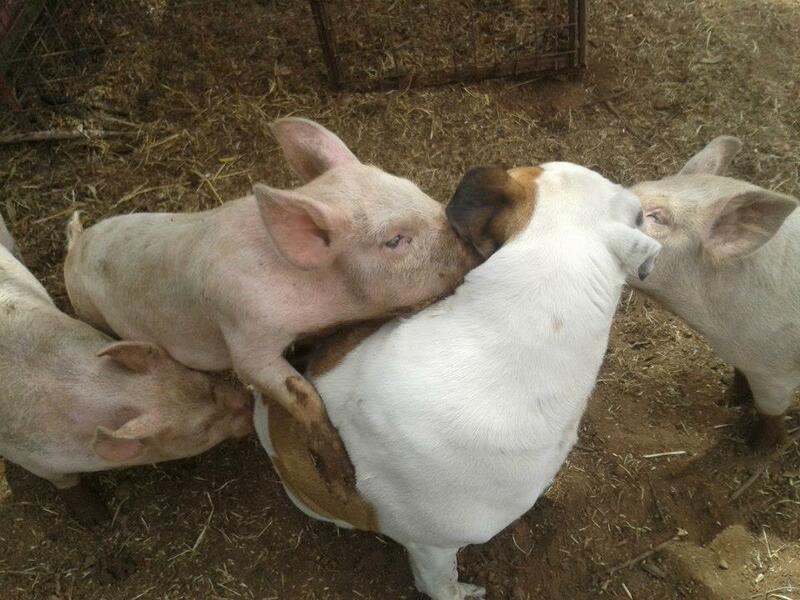 Bruce loves the pigs, but was not at al comfortable with this level of intimacy. 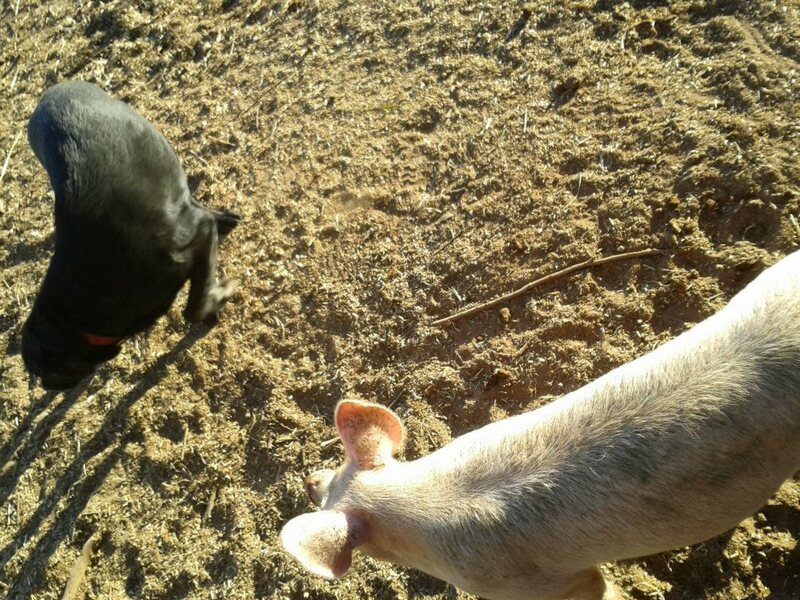 This is as close as Domino would ever get to the pigs. Bruce knows he’s safe when they’re eating. 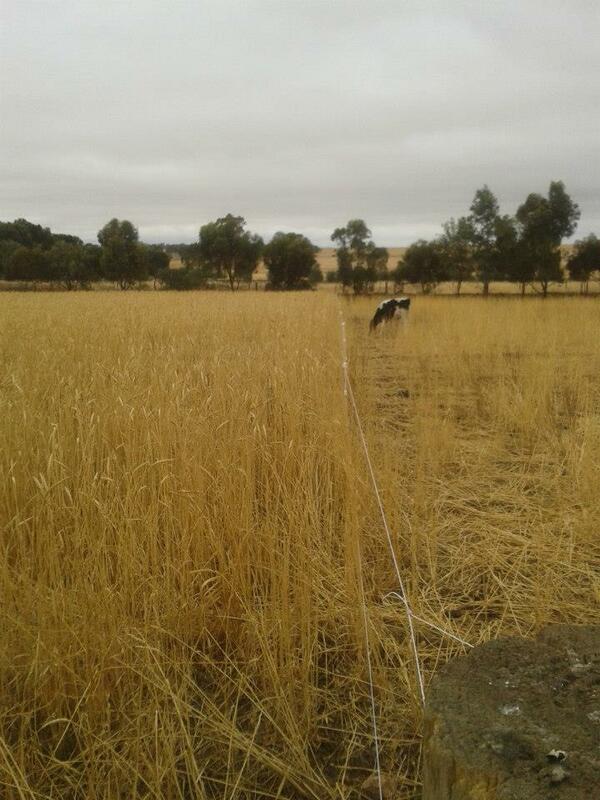 The cows were slowly eating down our 2 acres of wheat, though in a controlled way via our stand-off electric fence. You can clearly see where the cows have been allowed to graze. We managed to get some barley from our farmer neighbour. 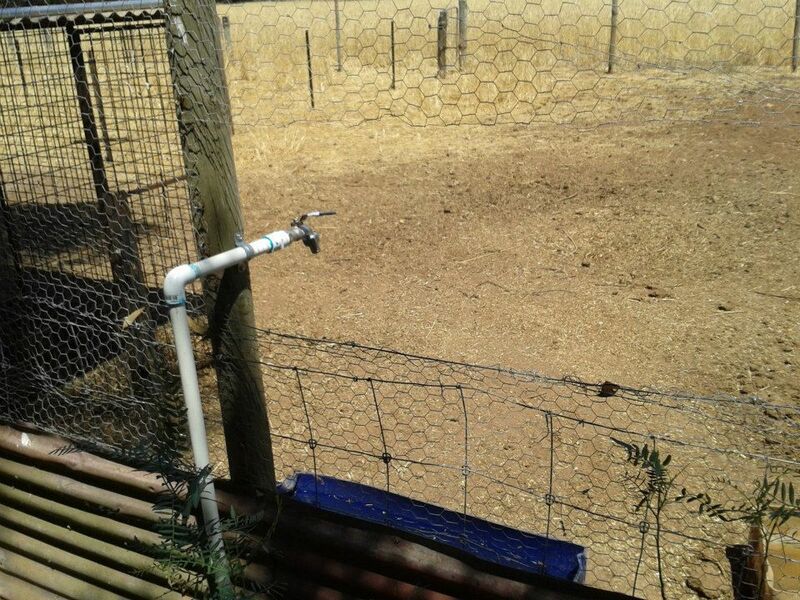 He had a small quantity (small to him) that he put aside for us from a smaller paddock he takes care of. It turned out to be 1.28 tonnes, and he charged us the wholesale price for one tonne. It turns out that it costs us less than 20 cents a kilogram, which is a fraction of what we pay for store-bought stock feed. 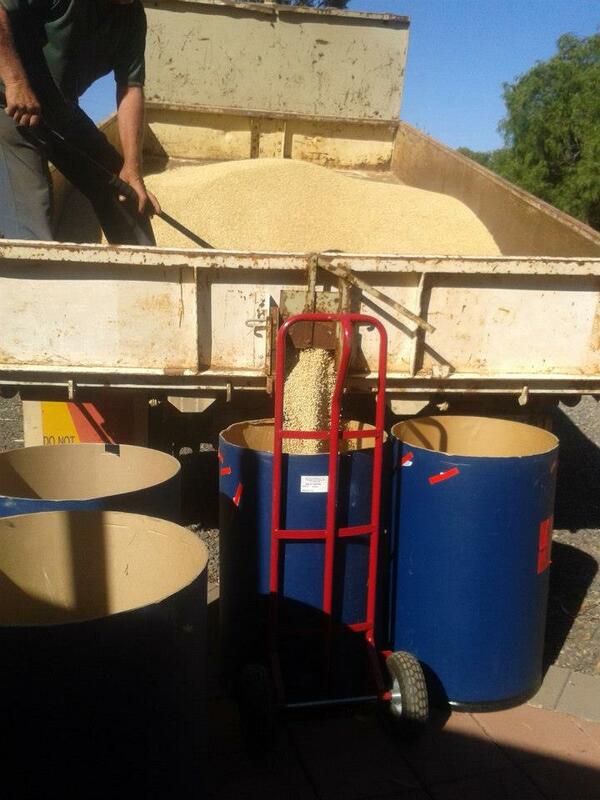 Barley, like any grain, needs to be cracked or soaked before being fed to stock. The energy uptake from the feed is increased incredibly over giving them whole grains. 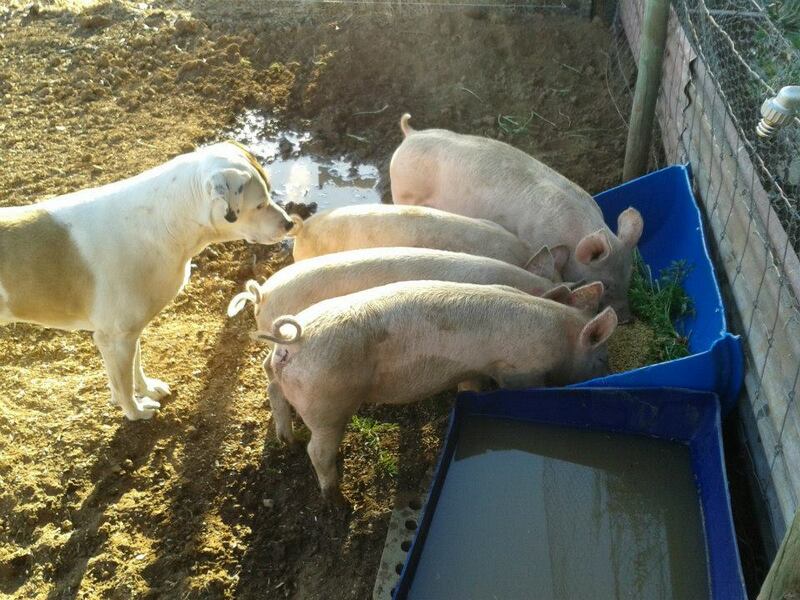 Our daily process changed to include soaking buckets of barley morning and night for the pigs. 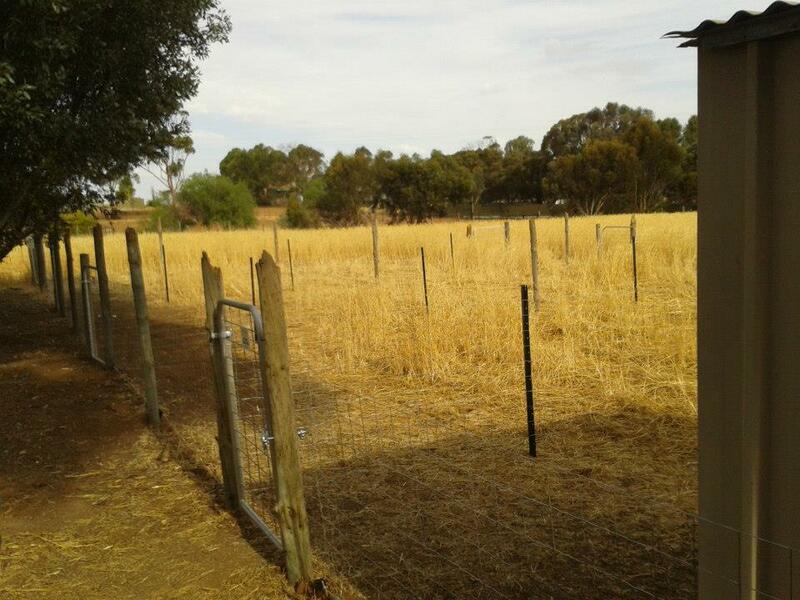 We managed to finish most of the rest of the pig yards over December, finishing the separate yards and running water to each of them. The pig yards coming together. 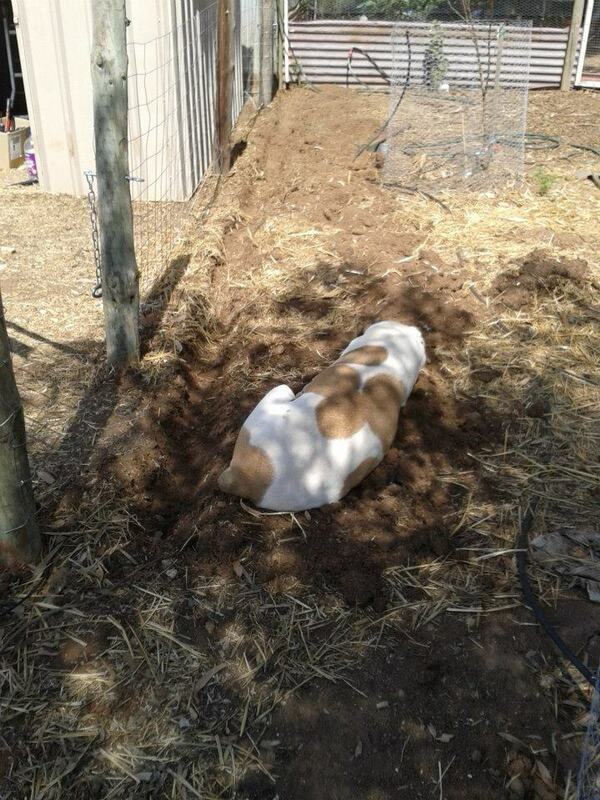 Bruce laying next to the trench for the water. He didn’t move, even with the pick hitting right next to him. 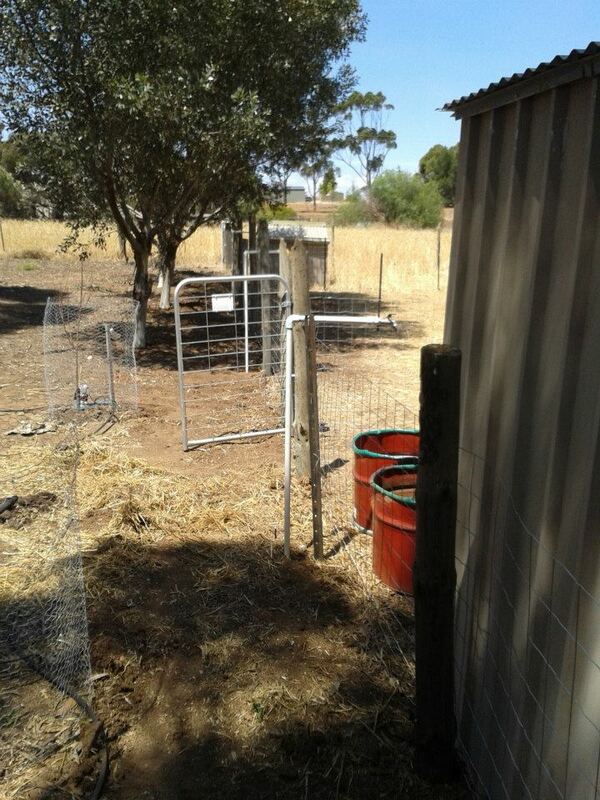 This is the hole we cut into the chook yard so Linhda can feed the babies without getting in with them. We had two big stock stories for December though, one involving a purchase and the other our first sale. 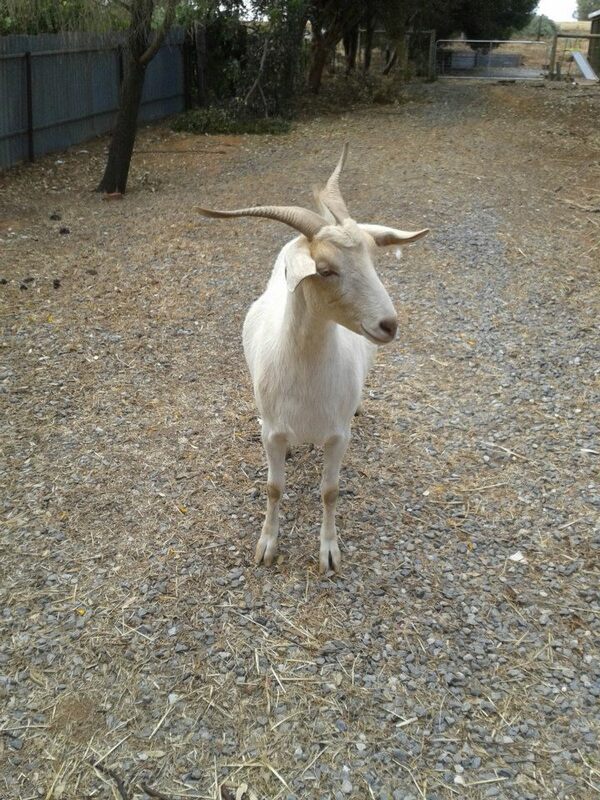 We were able to pick up our milking goat, Tinkerbelle, in the middle of the month. She had been with a billy for an entire month, but the people we bought her from weren’t confident that she’d be pregnant. Unfortunately, there’s no real way to know until it comes around time for her to drop (March/April). They’ve offered to have her back then to finish the job, but we know a guy who lives just down the road who has a herd she could run with for a while. I’m not sure if she wants to fight him or play with him. He’s not sure either. 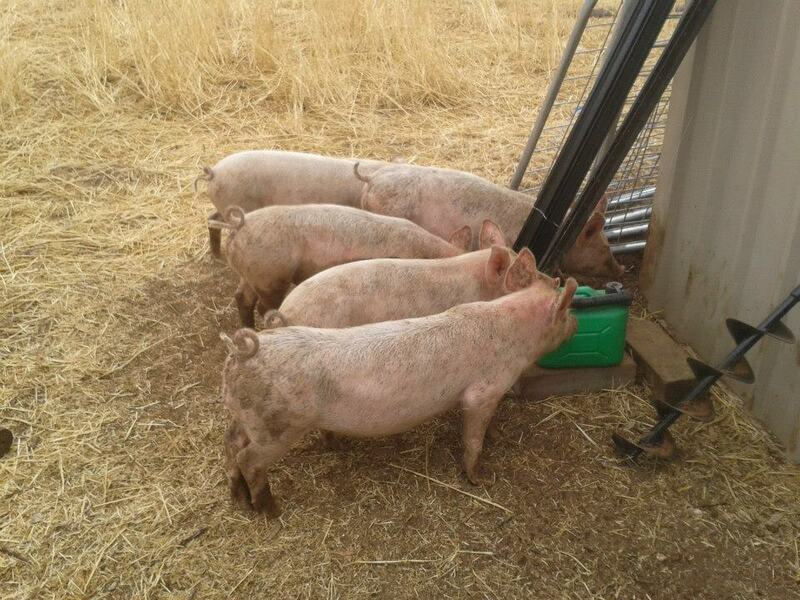 The stock story that made me happiest was us selling on two of our pigs. We had ended up with a lot more than we needed, especially after buying 4 boys to find a baby daddy for our girls. 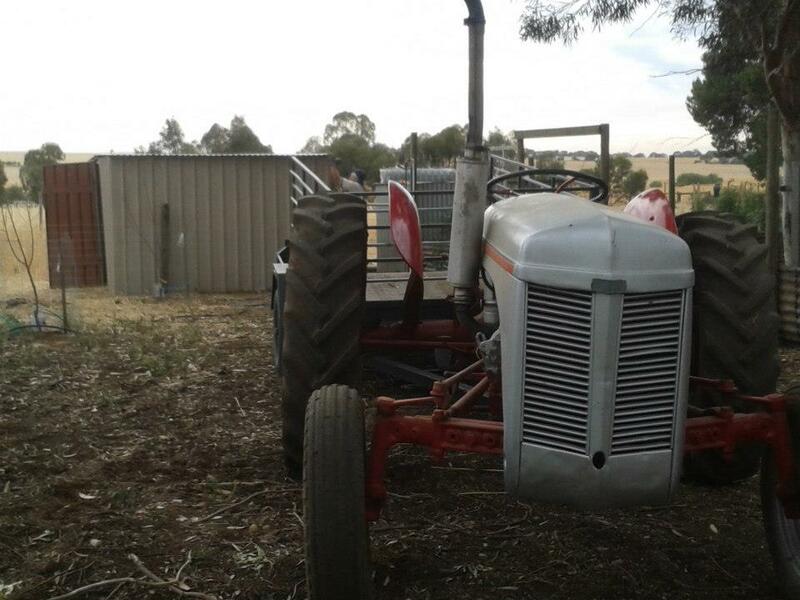 We advertised them on gumtree, hoping to sell one or two and recoup some of our money. We had scored these boys at about half of what they’re worth, and so advertised them at a slightly higher price. Obviously any pig we sell is probably going to go into somebody’s freezer. That’s no problem to me. I know that these animals have been raised with care, and at the risk of sounding wanky, with love. 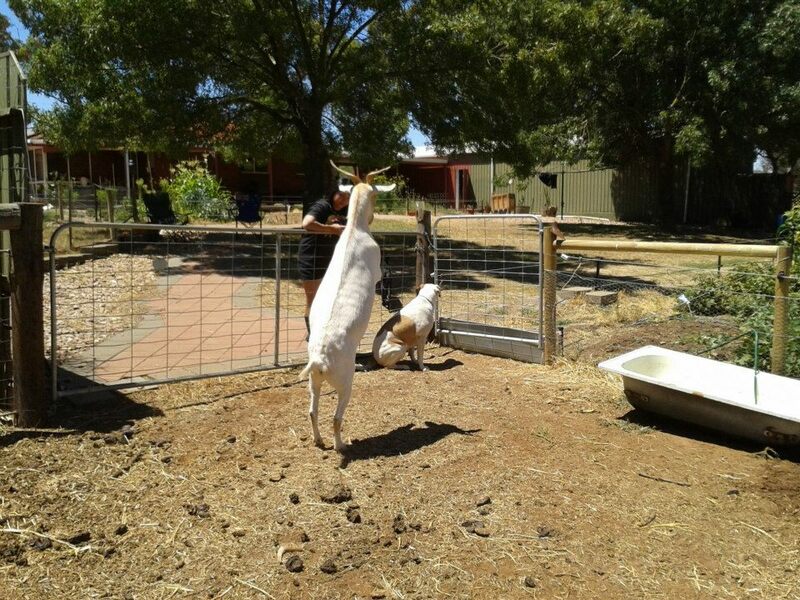 They are fed well, housed well, given attention and affection, and they’re happy. Their lives may end up being short, but I know they’re happy. In addition to that, without the need for meat they’d not exist at all. We had one guy come and look at the pigs, but I did not like him at all. He received orders from people he knew, found pigs online, and then processed them himself. I was picking his brain over how he did it, as it was a little business. I’m fairly sure it’s illegal, but that doesn’t mean he wouldn’t know things that would help me. He told me that little pigs like mine he’d kill with a hammer. That’s right. A hammer. It was at that point that I decided that none of my animals would be going home with him, so when he haggled I wouldn’t budge a cent on the price. Killing any animal is unpleasant, but an obvious necessity if you’re going to eat them. I know exactly how our animals are killed, have spoken to the butcher and had a tour of the facility. It’s done legally and humanely, where the animal is stunned and feels nothing. None of that involves being bludgeoned to death with a hammer. I was a little disconcerted by that experience, but I had a young guy call asking about getting a pair for breeding. We hadn’t planned on selling any of our girls, but the idea of selling a couple on who were going to live and breed really appealed to me. We got the biggest of the second lot of girls and the smallest of the last lot of boys, and split them out. A young couple came to get them the day before Christmas. His dad was an ex-pig farmer, but was out of the business. He wanted home-grown pork again, hence the breeders. It felt awesome to sell those pigs on. For one, we knew they were actually going to a happy life of breeding with people who knew exactly how to care for them. I even picked their brains over where they were keeping them, and it sounded like they’d set up the piggy version of The Ritz. I think the biggest feel-good moment out of this, however, was the fact that we’d actually sold some animals on, had doubled our money, and had made enough to pay for the bulk barley we’d just bought. It felt like a very real step towards true self-sufficiency. Linhda insists on taking pictures of me. I’m not sure why.